Somewhere along the line religion entered, and made humans believe they are just a body. We are actually 3 Fold parts consisting of Body, Soul and Spirit. Within the 3 Fold are sub parts. 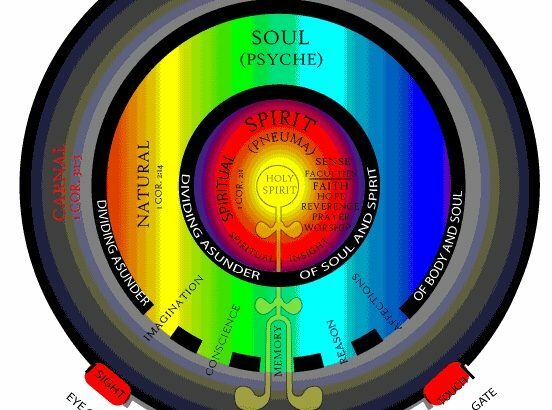 So in actuality we are mind, body, soul, spirit, will, and emotion. It is our spirit that was made in the likeness of God the Father, God the Son and God the Holy Spirit. 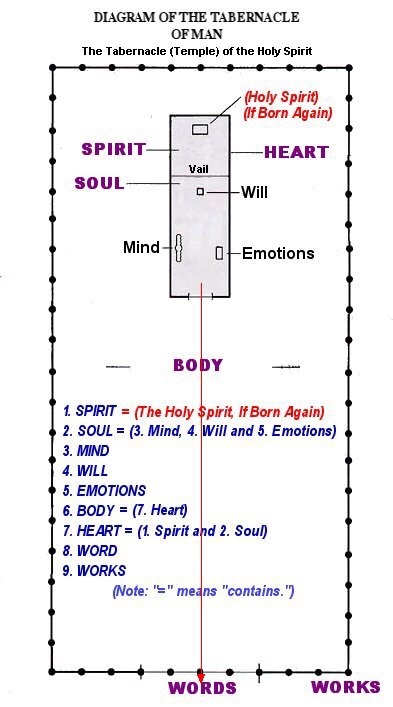 It is our Spirit Man that contains the 7 Spirits of God. When a person accepts Jesus Christ as their personal Lord and Savior the Holy Spirit come to dwell inside of us and makes its home there. This is the part of us that is totally God and the only part of us that can not be afflicted by fleshy things, and yes even demonic things. 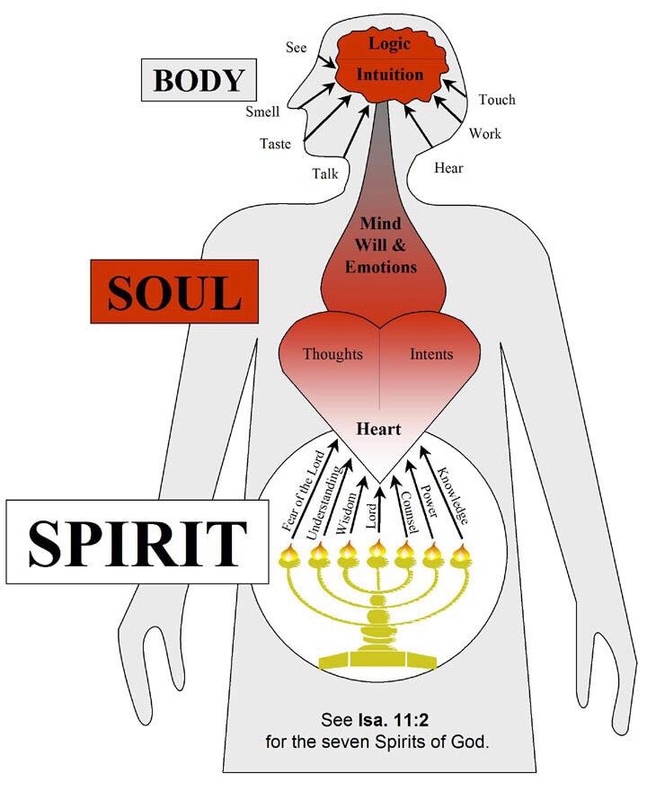 Let’s look at the picture diagram above for a moment and the placement of the spirit part of us. Do you notice it is in the stomach region, the gut per-say. How many times have you heard the following eufenisims. I have a Gut feeling, Gut instinct, a Moms Gut instinct. There is a reason for that and it’s because Holy Spirit lives in the Gut. Holy Spirit is, was, and always will be that Gut instinct. 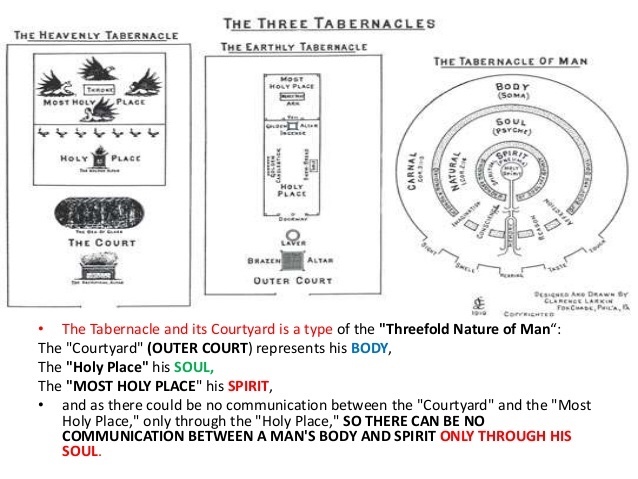 Holy Spirits habitat inside of us was modeled after the tabernacle. The other parts of us are the Fleshy soulish parts, they are the parts that can and do sin. 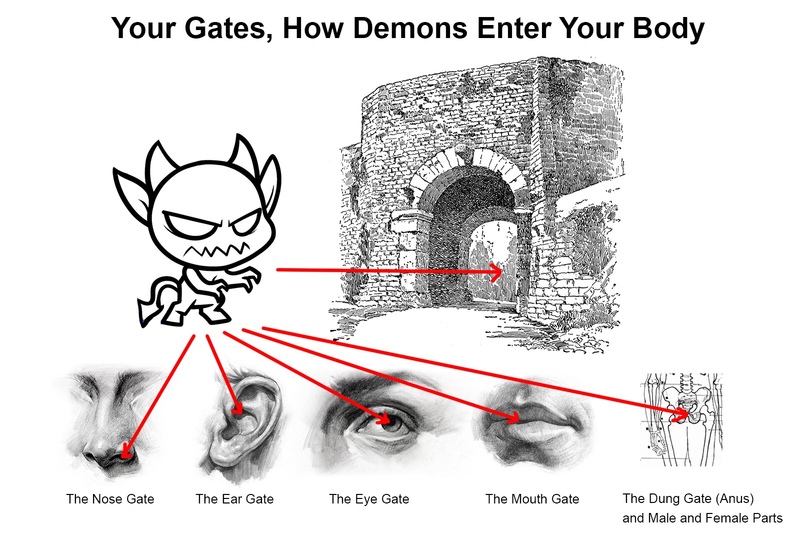 These are the parts that get us in trouble, the parts the enemy keeps a close watch on for one of our gates to open. Gates you say, what kind of gates to we have in us. Can a blood bought believer be afflicted with demons? The answer is a resounding yes, of course they can. No one can not be possessed because the spirit realm would need to be taken over. But a believer can be oppressed and afflicted. How can that be as tradition has taught differently? Yes of course it does, and blood bought believers of Christ Jesus who have asked Him to be Lord of their lives can never have their spirit man separated from Jesus. But keep in mind our flesh won’t follow us to heaven. But there is a reason that over and over scripture says to take control of your flesh. Generational sin, and Personal sin can enter through the gates infecting us. The good news is that Jesus already died for our sins we just need to ask for help. Here is a short prayer Jesus recently downloaded to me that takes ALL legal rights of the enemy away. Jesus you have said that ALL MEANS ALL. So right now I repent from ALL sin in my life that was knowingly or unknowingly done. I repent of ALL sin in my generational bloodline whether knowingly or unknowingly done. Replace ALL busted broken DNA in myself and my bloodline with your DNA, all the way back to Adam. Thank you Jesus that right now all legal right of the enemy has been removed from my life. Thank you that myself and the seed of my seed are redeemed and covered all the way till you come again. Do you hear that enemy ALL MEANS ALL, and ALL my sins are washed away. Prophetic christian, deliverance, demonic, ear gates, eye gates, ministry, prophetic, religion, salvation. permalink.